EV owners discovered this during the recent cold snap that hit central US and Canada. As temperatures plunged, owners of Chevy Bolts and Tesla Model 3s told CNBC they were seeing at most 50 percent less range in their vehicles. Extreme heat is also a drag on electric vehicles. When outside temperatures heat up to 95 degrees Fahrenheit and air conditioning is used inside the vehicle, driving ranges can decrease by 17 percent, AAA reports. Extreme temperatures certainly play a role in diminishing driving range, but the use of the vehicle’s heating, ventilation, and air conditioning (HVAC) system in these conditions — particularly the heat — has by far the greatest effect. The problem is that, unlike a car with an internal combustion engine that can warm the cabin with waste heat, EVs have to tap into their batteries to power the climate control system. Less battery power means more charging, which increases the cost to operate the vehicle. AAA’s study found that the use of heat when it’s 20 degrees Fahrenheit outside adds almost $25 more for every 1,000 miles compared to the cost of combined urban and highway driving at a balmy 75 degrees Fahrenheit. AAA tested five electric vehicles — the BMW i3, Chevy Bolt, Nissan Leaf, Tesla Model S, and Volkswagen e-Golf — all with a minimum EPA-estimated driving range of 100 miles. 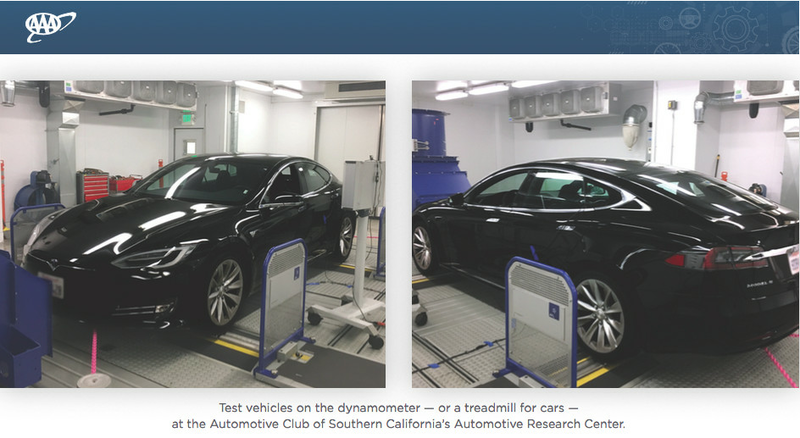 Real-world driving conditions were simulated using a dynamometer, which is essentially a giant treadmill for cars, in a closed testing cell where ambient temperature could be tightly controlled. To determine the effects on driving range, scenarios for cold and hot weather conditions — both when using HVAC and not — were compared to those of driving with a normal outside temperature. Surprisingly, AAA found the impact on range was pretty much uniform among the cars tested. EV manufacturers will have to find a way to communicate the effects of extreme weather to customer as they push to increase their sales market. In the meantime, owners can take some steps to help mitigate the effect of extreme heat and cold on their vehicles, AAA says. Take some time to pre-heat or pre-cool the car while its still hooked up to a charger. And plan ahead for frequent stops to charge if you’re going on a longer trip, so you don’t get caught on the side of the road with a dead battery.